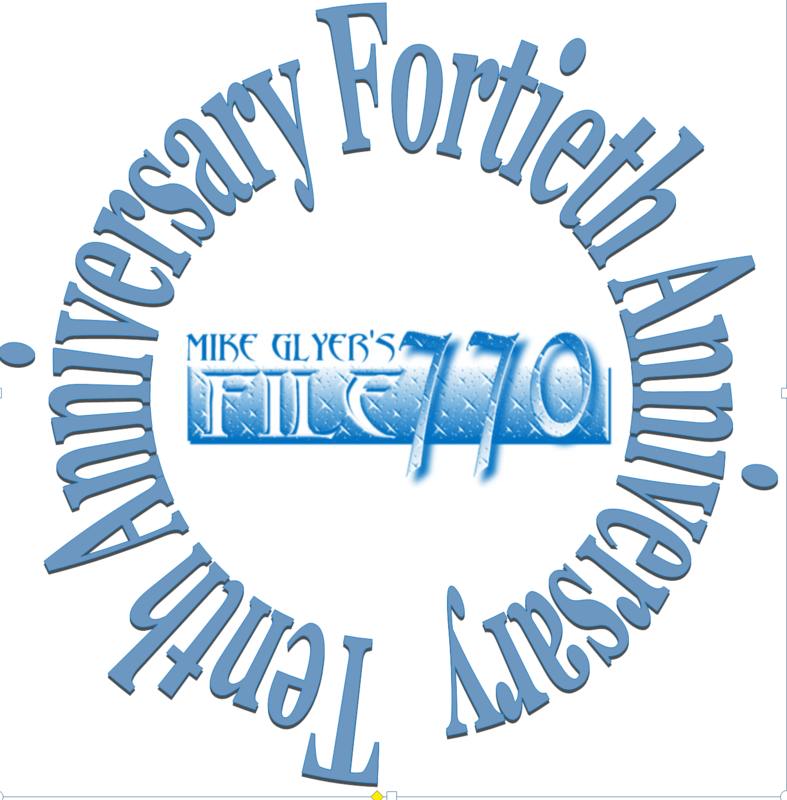 We’ve reached the second bookend of File 770’s 10/40 anniversary celebration. You never know how long a fanzine will be around. When the first pages rolled out of the mimeograph in January 1978, I decided it was premature to order personalized [File 770] license plates. But by now, the zine has outlasted 5 cars. And just as surprisingly, the blog itself has reached the age of 10 today. It might still be one of fandom’s best-kept secrets if not for John King Tarpinian’s January 2015 article “Viewing the Remains of Bradbury’s Home” and his photographs of the Bradbury home teardown that touched the hearts of all the fans who still hadn’t finished mourning Ray. John’s post became File 770’s most viewed up to that time (and is still in second place, behind “Sunday Business Meeting at Sasquan.”) It made more readers familiar with File 770 as a news source, preparing the way for the rapid audience expansion that happened when I started daily roundups of Sad/Rabid Puppy news. I actually did those for only three months (and the titles people came up with launched another tradition). But the commenter community that grew out of them inspired me to invent the daily Pixel Scrolls, fan news and pop culture roundups, so we continue to have issues to discuss and ideas to play with. 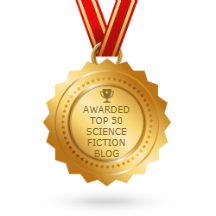 Of the dozens of frequent contributors I owe thanks to, I especially want to remember John Hertz, who spans so many times and cultures in his writing; JJ, for vast review projects; Chris Barkley, a passionate fannish advocate; and Carl Slaughter, whose interviews help steer this blog toward its polestar interest in sff. I’ll also never forget the late James H. Burns, who specialized in reminding us that fandom is fun. Usually his posts here were inspired by memories of “growing up fannish,” such as the very popular Once, When We Were All Scientists, and CLANKY!. But Jim was especially proud of a trio of posts that paid tribute to the influence of his father — My Father, And The Brontosaurus, Sons of a Mesozoic Age, and World War II, and a Lexicon in Time. Thanks to all of you who contribute a review, a filk, a cat photo, or in some other way use your creative abilities to energize the conversation at File 770. 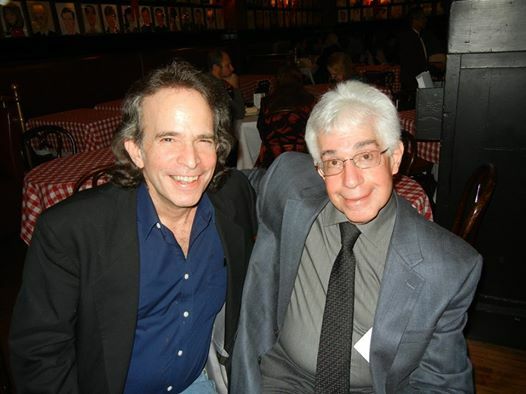 By Steve Vertlieb: With the late James H. Burns at Sardi’s in New York for dinner during a chilly Winter’s evening in December, 2014. Jimmy was one of my most cherished pals. He was my friend, my muse, my collaborator, and my brother. We would chat literally for hours each week into the proverbial “wee small hours of the morning.” We’d laugh, we’d argue, we’d celebrate the best and the worst in the arts and in life. Jimmy was as “corny as Kansas in August,” but he could also challenge one’s core beliefs with spirited discussion, and overwhelming intellectual conviction. He was a passionate, tireless advocate of the arts, both in journalistic pride, as well as theatrical participation. Jimmy loved baseball, and was its most inspired supporter. Whether arguing over the big leagues, or merely cheering on a tiny little league game on the corner of his block late one balmy Summer’s night, no one loved the game more than Jimmy. His puns were terrible, and his laughter infectious. He could be maddeningly persistent in his sometimes self-righteous beliefs, and spirited interrogation, but Jim was never a phony. He stood by his own personal standards of equality and justice, and fought ferociously for his beliefs. 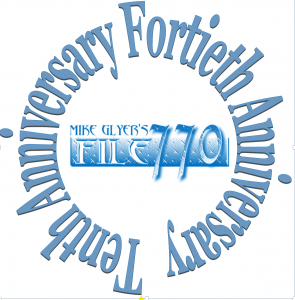 He was among the original writers and columnists for Fangoria Magazine, and a compelling contributor to Newsday, The New York Times and, in his final days, Mike Glyer’s Hugo Award winning File 770. Jimmy grew more introspective and, perhaps, melancholy in his later years, writing what amounted to sheer poetry in his brief, yet utterly charming and beautiful remembrances of days and years “past remembered”, but not forgotten. He was among the most dedicated and creatively committed individuals that I’ve ever known. Jimmy was my conscience, and my shadow. When I nearly died seven years ago during major open heart surgery, he was my humorous cheerleader and spiritual angel, telephoning me often three or four times during a single day to make me laugh, and to remind me of just how special life could be. I cherished our friendship, and revere his memory. I miss our infinite, often interminable telephone correspondence, conversations, and arguments. Jimmy loved New York more than anyone I’ve ever known. It was during that sweet Christmas of 2014 when he enthusiastically “dragged” Shelly and I all over Manhattan to show off the vibrant city that he so loved. He was a writer, an actor, a journalist, a film and baseball historian, and a deeply passionate human being. More than that, however, he was my brother, my champion, and my friend. I’m thinking of Jimmy today and always, but particularly on this poignant first anniversary of his untimely physical passing, and departure from this all too lonely planet, and remembering the wonderful James H. Burns. I miss you, dear friend. Rest well, Jimmy. Jim Burns and Steve Vertlieb. By Steve Vertlieb: My win for the 2016 Rondo Hall Of Fame Award the other night was, is, and always will be tempered by the heartbreaking news and realization that my beloved friend and brother, Jim Burns, has tragically passed away at age fifty-four of an undisclosed illness. Jim was one of the best friends that it’s ever been my honor to have. He was a cherished pal, confidante, and brother. Jim and I would speak for hours on the telephone, catching up on the latest news, talking, and always, always laughing. When I nearly died just six or so years ago during major open heart surgery, Jim was ever on the telephone, and always sending me supportive e-mails and love. Jim pushed hard for my lifetime achievement award at the Rondo’s every year, and it was Jim who joyously announced my win for the Hall Of Fame by awaking me from a deep sleep just two months ago to inform me that I’d been elected to the Rondo Hall Of Fame. 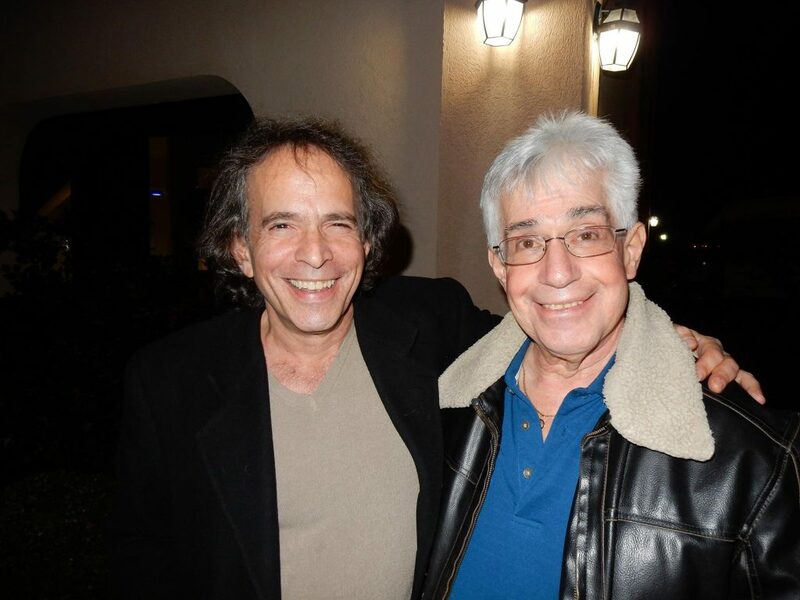 My elation on Saturday morning in Louisville, Kentucky, was abruptly shattered when David Colton (the head ot the Rondo Awards, and former editor of U.S.A. TODAY) gave me the terrible, terrible news that Jim has passed away on Thursday, June 2nd. Jim…I love you. I shall always love you. I cannot believe that I’ll never hear your voice, or your terrible jokes ever again. I cannot believe that I’ll never again know the happiness of reading your prolific commentary on the arts. Your work was sheer poetry. It was beautiful, haunting, and evocative. Your last years were tortured, and I hope that you found a degree of comfort in my love and respect for you, and in our profound bonding and friendship. I dedicated my Rondo Award to you in my acceptance speech in Louisville Saturday evening. You always wanted to win a Rondo but never had an opportunity to do so. May it bring you a degree of solace to know that David Colton dedicated this year’s Rondo Awards ceremony to you. I love you, Jim. I miss you…and I cannot believe that I will never have an opportunity to speak with you again. God Bless you, my friend. God Bless you, my cherished brother. Sleep well, Prince Jim. Sleep throughout eternity in the knowledge that you shall always be loved….both by me, and by so many adoring friends and fans. A day of mourning. Frequent File 770 contributor James H. Burns has died, found by his landlord on June 2. A month ago Jim was hospitalized for blood clots in his legs and put on blood thinners. After he was released, Jim also told me he was troubled by other medical “mysteries,” comparing his case to an episode of House but without ever saying in so many words what the problems were. Now other friends of Burns’ are saying on Facebook that doctors found a lump in his lungs and he’d been scheduled for a biopsy on Wednesday, but having no one to go with him had stayed home. By the next day he passed away. 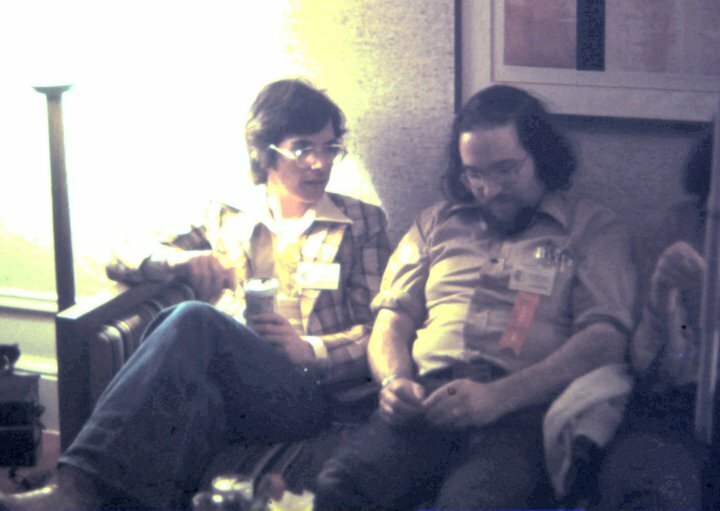 James H. Burns circa 1976 or 1977 with long time SF fan and 1970s convention organizer, Steve Rosenstein. Photo by Patrick O’Neill. 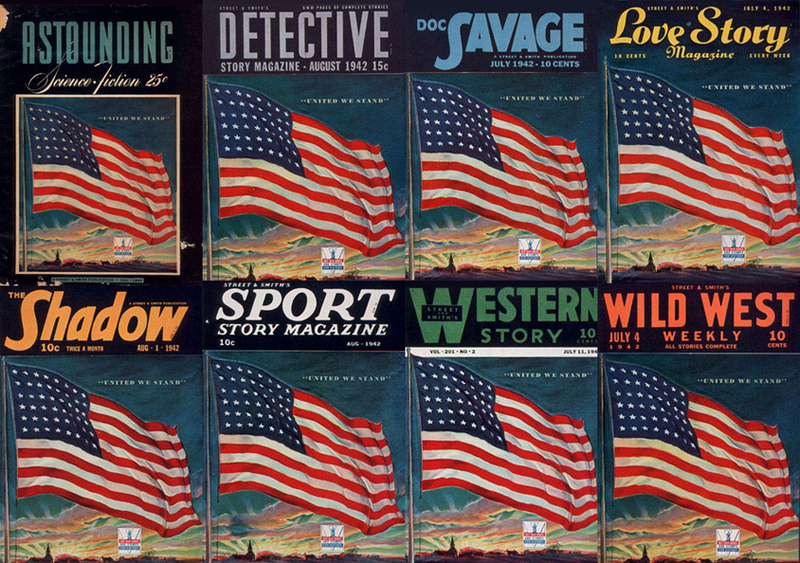 He was among the first writers for Starlog and a contributing editor to Fantastic Films, and Steranko’s Prevue. 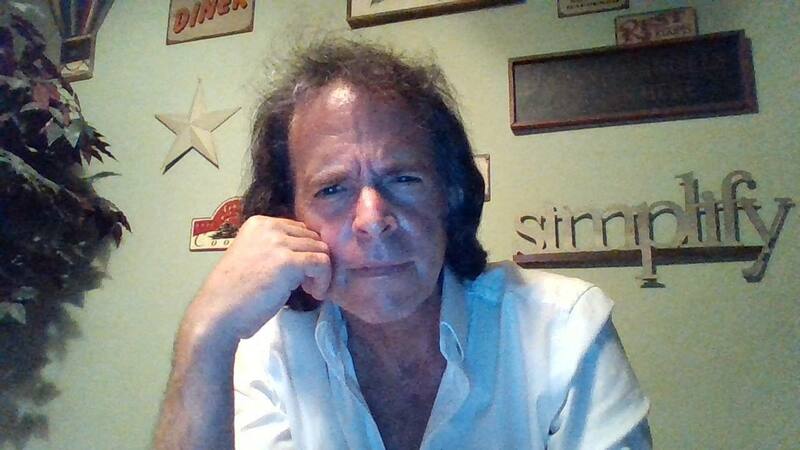 Jim was one of the first genre magazine nonfiction writers to cross over to mainstream publications like Gentleman’s Quarterly, Esquire and American Film, while continuing to write for Cinefantastique, Starburst, Heavy Metal and Twilight Zone magazines. Jim also had the chance to appear in some movies, given minor parts in Igor and the Lunatics (1985), On the Q.T. (1999) and For Love of the Game (1999). 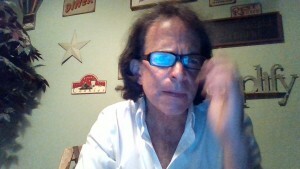 In his last years he became active in radio, and authored Op-Eds and features for Newsday, The Village Voice, thesportingnews.com and The New York Times. Jim had a large fund of anecdotes about sf, movies, tv and the New York theater, which he enjoyed sharing on several fannish blogs and in the forums at the Classic Horror Film Board. Around 2012, Jim discovered File 770. Initially I was signal boosting his pieces for other sites, Jim earning his way by authoring entertaining original “hooks” that made fans want to click and read the rest. I always wished Jim was writing that stuff for me – and eventually my wish came true. He became one of the most active and creative participants here. The past two years we’ve exchanged e-mails every couple of days, Jim constantly coming up with ideas, drafting new articles, or finding ways to adapt material published earlier in his career. 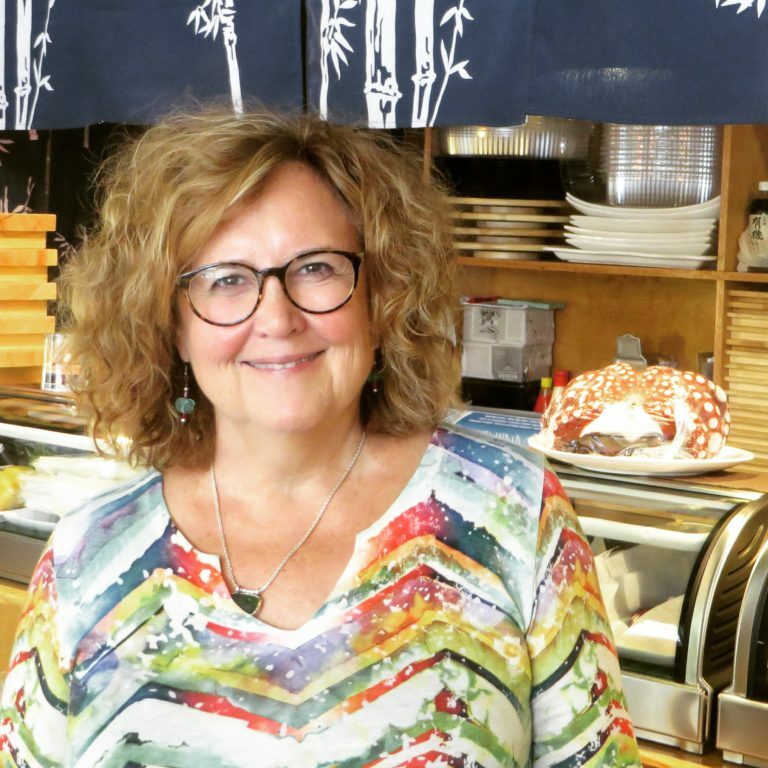 Jim was especially proud of a trio of posts that paid tribute to the influence of his father — My Father, And The Brontosaurus, Sons of a Mesozoic Age, and World War II, and a Lexicon in Time. 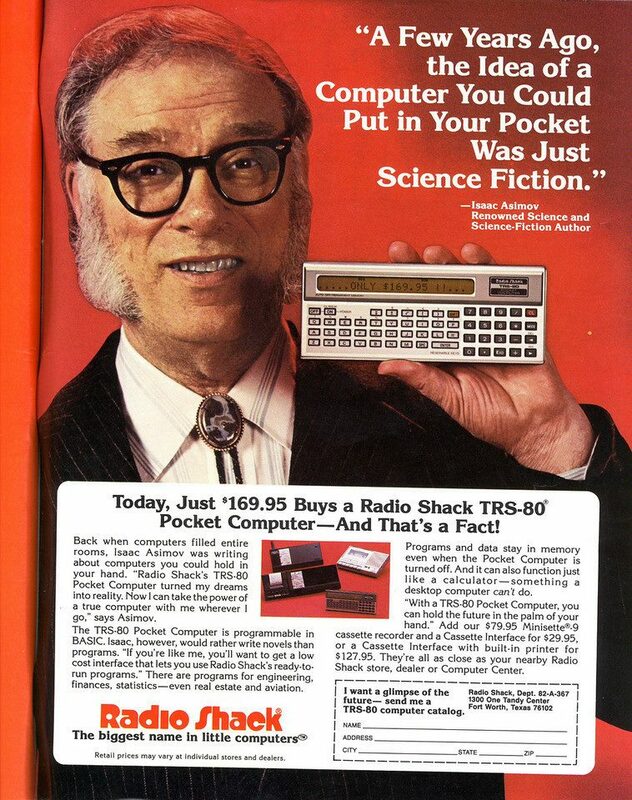 Quite often his posts here were inspired by memories of “growing up fannish,” such as the very popular Once, When We Were All Scientists, and CLANKY!. He also wrote about celebrities he’d known (Joe Franklin, R.I.P., THE Man from U.N.C.L.E. ), comics history (Marvel Comics to Implode — End of a Fifty-Plus Year Era and Lee Falk’s Phantom of Happy Memory), longtime figures in NY fandom who’d passed away (Alan Levine, “Original Dealer,” 79 Years Old, R.I.P. 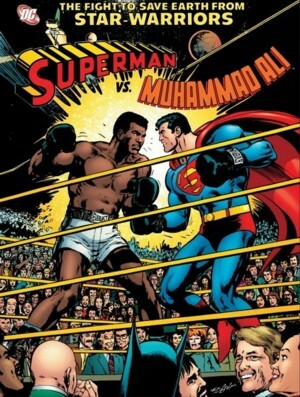 ), and pop culture classics that needed a champion (Are We Ready Again For George Pal’s Puppetoons?). Jim’s strength as a writer was his ability to remind readers why they were – as he was – sentimentally attached to the works and experiences that brought us into fandom. That’s been a lifeline for me amid the uninterrupted controversies that fill my blog. Filers often ask each other what they love. That question was one Jim clearly enjoyed answering over and over. How much he will be missed.